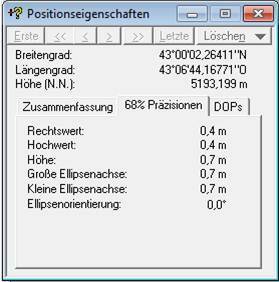 ^ The elevation and coordinates given here are taken from a DGPS survey by Peter Schoen and Boris Avdeev in association with GeoAT. It was carried out in July 2010 and made available in November 2010. 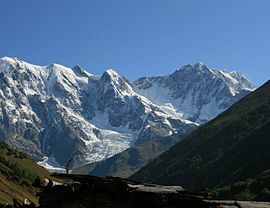 Some sources, including the Great Soviet Encyclopedia, give the estimation of only 5,068 metres (16,627 feet), but this is the correct height of the lower western summit. 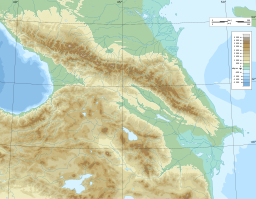 Soviet era 1:50,000 mapping shows a 5,158 metre spot height to the east, and this can be verified using a panoramic photograph taken from Elbrus. The true elevation is on higher ground still further east along the Shkhara ridge. ^ 3.0 3.1 Audrey Salkeld (编). World Mountaineering. Bulfinch Press. : 70. ISBN 0-8212-2502-2.